The 6 ft cat6 ethernet cable features 8 stranded bare copper conductors 24 AWG. Each of the 4 unshielded twisted pairs (UTP) are separated by a PE cross insulation to isolates pairs and prevent crosstalk and covered by a 5.8mm PVC jacket with RJ45 connectors and gold-plated contacts. It is UL listed, complies with TIA/EIA 568-B.2, is ETL verified and RoHS compliant. 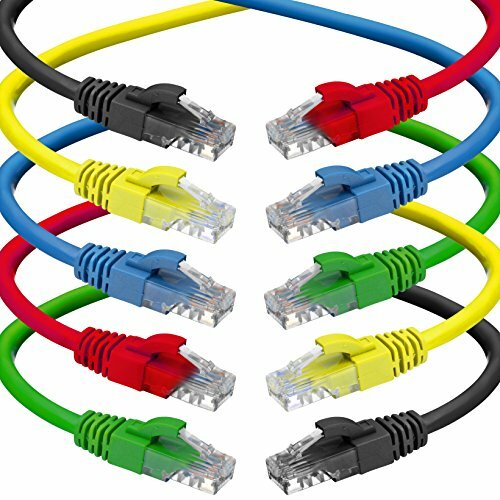 10 (2 red, 2 blue, 2 yellow, 2 green, 2 black) Cat 6 patch cables, 6' each, PVC jackets. CONFIGURATION - The 6 feet cat 6 ethernet patch cable features 8 stranded bare copper conductors 24 AWG. Each of the 4 unshielded twisted pairs (UTP) are separated by a PE cross insulation to isolates pairs and prevent crosstalk and covered by a 5.8mm PVC jacket with RJ45 connectors and gold-plated contacts. The molded strain relief boots help avoid snags that will damage your cables. They are molded for flexibility and resist common wear and tear.